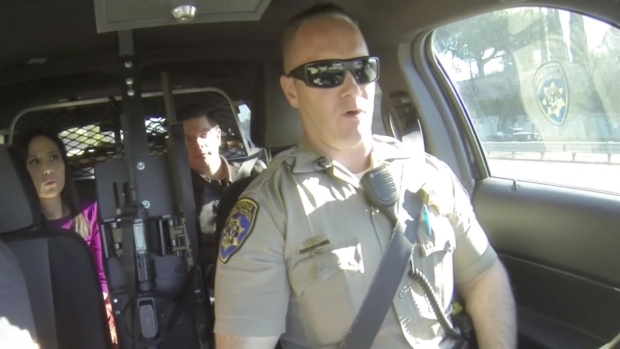 The NBC Bay Area Investigative Unit reviewed years of accident records and found that crashes on the shoulder during police traffic stops are more common than you might think. While law enforcement agencies do not directly track the number of accidents that occur during traffic stops, statewide collision data shows 2,708 crashes involving 2,757 parked law enforcement motorcycles and cars since 2013. Those accidents include highway patrol and local officers who were helping stranded drivers, looking for speeders, or working enforcement stops on the shoulder. 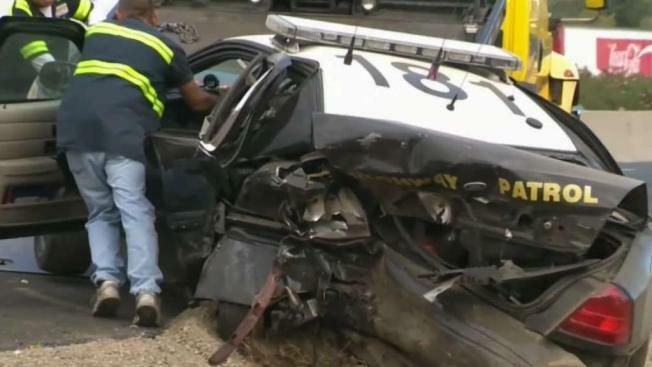 CHP Officer Ross Lee told NBC Bay Area that he survived a frightening crash while issuing a ticket on Interstate 280 near Cupertino after a rubbernecking driver veered off the road and into his car. "I cut my forehead. [The accident] knocked me onto this raised embankment, " Lee told NBC Bay Area while showing the scene. "It threw me back on the shoulder 10 feet. It was very scary, happened very fast." Lee said just about every officer he knows has been in an accident or knows someone who has been in an accident during a traffic stop. However, he said he still feels comfortable stopping motorists on the shoulder instead of exiting the freeway and moving away from traffic. CHP Officer Ross Lee explains how he was injured during a traffic stop on I-280 near Cupertino. For drivers looking to avoid an accident by parking away from the highway, the consequences can be just as severe. Last summer, a Livermore police officer tried to stop Lavanz Crosby Jr. on the shoulder near a freeway onramp while driving his girlfriend’s new car. Crosby thought the location was unsafe and opted to park in a shopping center less than a mile away. According to Crosby, that decision almost cost him his life. "As soon as I looked up, the officer had his gun pointed at me and yelling, telling me to keep my hands up. I was trying to keep myself under control because I didn’t want to get shot," Crosby told NBC Bay Area. "[The officer] asked me why I didn’t stop. I said I work in transportation, and I didn’t see anywhere safe to stop on that overpass. [The officer] just said shut the [expletive] up. When the cops put our lights on you [expletive] stop." Crosby was arrested and taken to jail, but no charges were ever filed. According to police records, the officer had a change of heart after the arrest and called the District Attorney’s Office to ask prosecutors not to charge Crosby for evading an officer. In his report, the officer wrote, "Crosby honestly thought he was doing the right thing by trying to find a safe place to park." The officer initially stopped Crosby because he suspected the newly purchased car was stolen. It was not. NBC Bay Area reached out to Livermore police for comment, but the department declined the interview request. CHP Chief of Enforcement and Planning Jim Epperson said all officers are well-trained when it comes to conducting safe enforcement stops. "The planning starts well before you see the red light," Epperson said. "We know the freeways that we work and we plan to stop you in the safest location because we understand the hazards. We try to mitigate [hazards] as much we can." Epperson still suffers from health issues related to a 1999 traffic stop that left him with severe injuries. "I heard the brakes coming and another truck, who after a while admitted to not paying attention, hit my truck about 80 miles an hour," he said. Epperson suffered a skull fracture, in addition to neck and back problems, forcing him to miss nine months of work. Still, Epperson insists his officers, who conduct roughly 2 million stops a year, know how to do it safely. "All we can say is when you see that red light, just start moving to the right," Epperson said. "If we need something else, we'll let you know. But we have probably already planned for where we’re going to stop you." In 2006, Gov. Arnold Schwarzenegger signed a law requiring all drivers to move over or slow down when they see emergency workers on the side of the road, which includes traffic stops. "You’re covered by law that everyone is supposed to slow down and move over, so there should be a safety buffer around that situation," Epperson said. But more than a decade after the "Move Over" law took effect, driving school owner Randy Zimmer believes it still provides little protection. "If you interview 10 people on the street and ask them about the move over slow down law, they would not have a clear understanding of that," Zimmer told NBC Bay Area. "If you’re near an exit, I think getting off on the exit is totally reasonable." With hundreds of crashes every year Zimmer believes officers could save more lives by taking their traffic stops off the side of the road. However, Epperson fears that if regulators tried to force officers to avoid using the shoulder unless there’s an immediate threat, it could prevent officers from properly doing their job. CHP expressed similar concerns when the "Move Over" law was first introduced. The agency now credits the law with reducing fatal traffic accidents for all emergency workers.